Keto Hamburger Buns Recipe - "Perfect Low Carb Bread Rolls" - Easy Make & Bake! Say goodbye to lettuce wrapped burgers and Hello to Soft, Fluffy Keto Hamburger Buns! 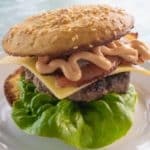 We’ve modified our Popular Keto Bread recipe to make these sturdy, Low-Carb Burger Buns. In a mixing bowl, add the almond flour, psyllium powder, baking powder and xanthan gum and mix well. Make a well in the centre of the dry ingredients and add the yeast and inulin, followed by the warm water. Mix the yeast, inulin and water and leave to proof for 5 minutes, until the yeast is foamy. Grease a muffin top pan with a little olive oil. Even spoon the mixture between 4 holes and sprinkle with the sesame seeds. Leave to proof in a warm place for 15 minutes. Bake the rolls for 15-20 minutes until they are golden brown and spring back when touched.